pFuel v0.04.03 freeware for Palm treo phone and pda, PalmOS free downloads. SU: Additions v2.09 freeware for Palm treo phone and pda, PalmOS free downloads. Palminfocenter >> Foleo Delayed Until Late September/Early October? Foleo Delayed Until Late September/Early October? Engadget 說 Palm 將在十月推出第一支 linux-based 智能手機..
intomobile >> Palm chooses Wind River for Foleo's Linux platform, first photo of retail packaging! Palm chooses Wind River for Foleo's Linux platform, first photo of retail packaging! Palminfocenter >> Treo Rumors & Analysis: Four New Treos Forthcoming? Treo Rumors & Analysis: Four New Treos Forthcoming? intomobile >> Idea: Palm should push Foleo as a blogging tool! Idea: Palm should push Foleo as a blogging tool! 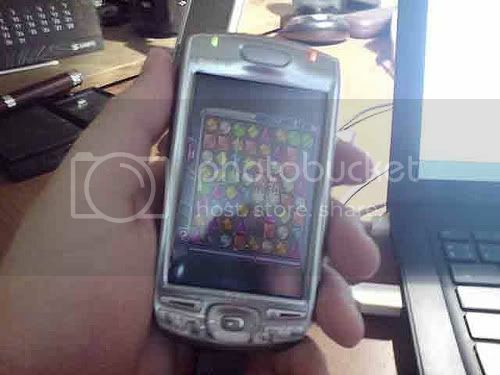 PalmAddicts: Rumor - Is this the new Treo 900p? Or a bad PhotoShop Job? * Bug fix: dismiss alarms with one tap on the native pop up. * Bug fix: The share app function cannot cause a soft-reset anymore. * Bug fix: The next alarm function is now without drift correction time. * Bug fix: No blank screen under the keyguard. * Bug fix: Bypass the keyguard if using the 3 second auto-off. * Many thanks to maceyr of PalmDiscovery for beta testing. Watchmaker v1.5.3 freeware for Palm treo phone and pda, PalmOS free downloads. pFuel v0.04.02 freeware for Palm treo phone and pda, PalmOS free downloads. 1src Forums - Install VCF files from card in to Contacts? Foleo 上將要有 PocketTunes 的消息應該不算新鮮，看來愈來愈多人會對 Foleo 寡目相看。不過，對於 Palm 提到沒辦法在 Foleo 上看影片的說法，還是令人有些遺憾。這位作者甚至說，內建瀏覽器 Opera 要不要考慮支援 tabbed browsing ?